It’s finally spring time here in Leesburg and I am SO excited for the warm weather! As the ground thaws out and you begin to venture outdoors again, you may notice the wildlife is doing the same. This time of year is very popular for baby geese, ducks, squirrels, and all kinds of birds, along with other animals. 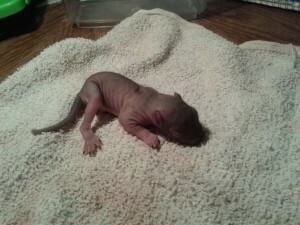 You may stumble upon some babies and think they are orphaned, but that is not always the case. 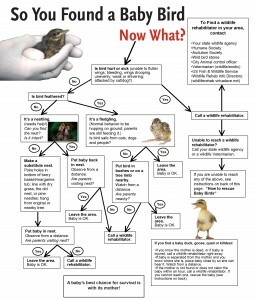 Unless you are sure the animal is injured or orphaned, you should leave it alone. Some things that should signal the animal needs help are if it is bleeding, shivering, deceased parent nearby, or crying/wandering all day. If it is a bird and is featherless or nearly featherless, that is also a sign that it needs help. If you have indeed found an injured or orphaned animal, the first thing you should do is contact a wildlife rehabilitation center. 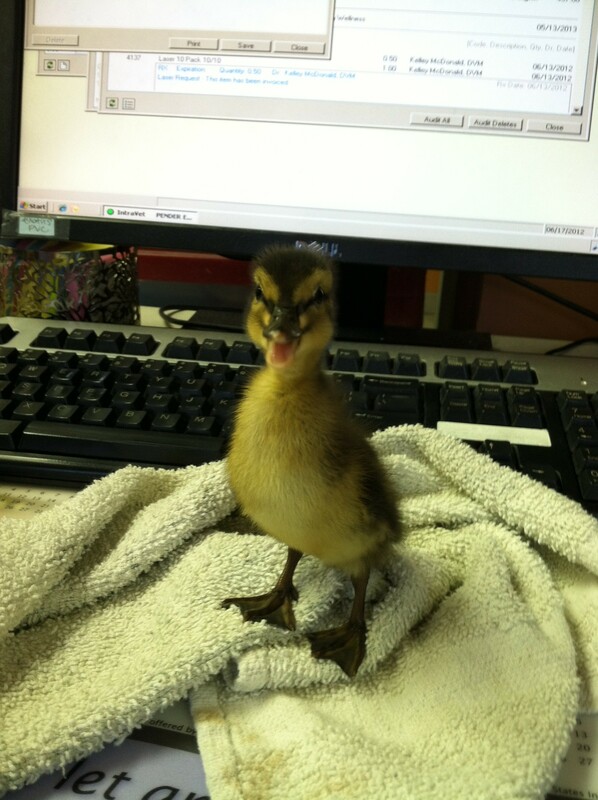 The Wildlife Hotline can be contacted at 703-440-0800. They have volunteers that will return your call and let you know how to proceed. Pender Vet Exotic Animal Hospital in Fairfax, VA, will also help assist you with wildlife. To contact them, you may call 703-654-3100. 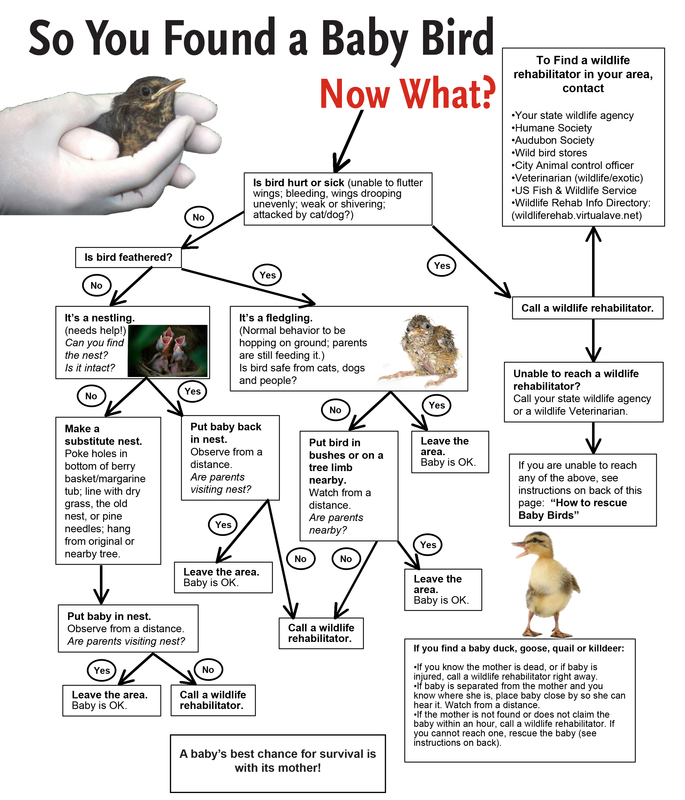 You will likely need to transport the animal to a facility where it can be properly cared for. The best way to do this is to prepare a small cardboard box, such as a shoe box. First, you will need to punch a few air holes from the inside of the box. Second, find a small towel, washcloth, t-shirt, or other soft item that does not have any strings or holes and place it in the bottom of the box. Do NOT attempt to feed or give water to the animal. The animal could aspirate, drown, or the food could cause them harm. To get the animal into the box, you will need a light jacket or towel to lightly drape over them. If at all possible, you do not want to handle the animals with your bare hands. This is for your safety and theirs. Wildlife can carry all sorts of nasty parasites. Once the animal is safely inside the box, close the lid and set it in a warm, dark, and quiet place until you can transport it to a wildlife rehabilitator. Remember, wildlife aren’t used to our noise and come become stressed out easily! For more information on what to do with injured or orphaned wildlife check out The Wildlife Rescue League’s website. © 2019 Veterinarians in Leesburg | Market Street Animal Clinic.